Ed "Shiftless"Dickinson started this car from a Nova F440 (now F500) chassis. 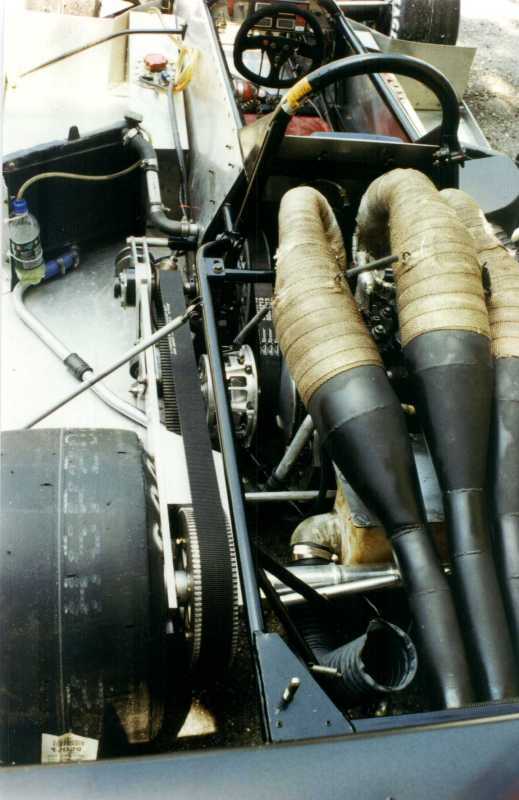 In 1988, he modified it for his engine and sports racer bodywork. Ed used a 800cc ZRT Arctic Cat snowmobile engine. No modifications were made to the motor other than changing the effective compression ratio from 6.5:1 to 8:1, and blueprinting the crankshaft. 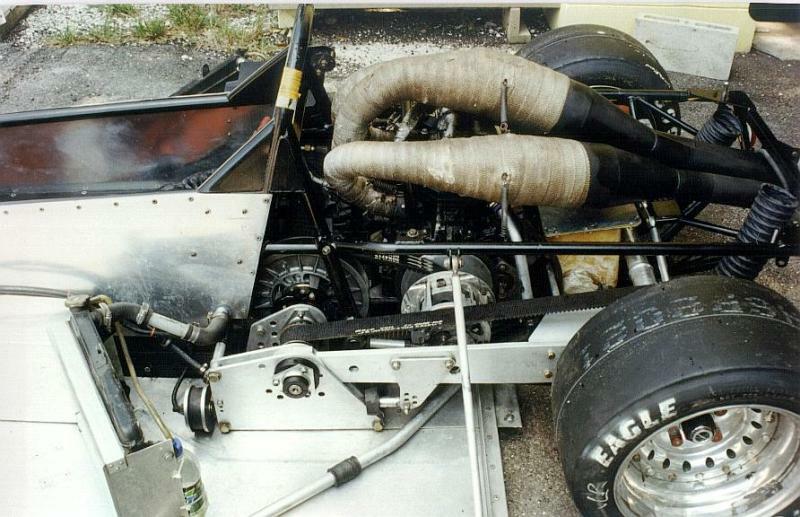 The engine, with this setup, produced 180 to 185 hp. This is from basically a stock engine, and therefore it retains a lot of reliability. "No engine failures are encountered as long as the jetting is right and you maintain the engine regularly (re-ring twice a year, change pistons once a year, and rebuild crank annually)." The car had a full data acquisition system. Power came from special pipes made by D&D cycles and Snowmobiles out of Loweville, NY, a dual reed system, and a pressurize airbox that took one year of development. Pressurizing the two stroke motor was quite difficult, and Ed will not share information on how he accomplished this. Ed says, "The airbox made an incredible difference. I went from fighting for the lead, to winning races handedly." The primary clutch was a billet Micro Bellmont clutch (a must if you are going to put the power to the ground consistently and reliably). The secondary clutch was a reverse helix Arctic Cat that had been modified. The car did not break belts, which was accomplish by having perfect belt alignment and stabilizing the the clutches from any and all deflection. The Gates Rubber Company was one of Ed's sponsors, and he tested all their new prototype belts. Special Note: The clutches had infra-red sensors that measured the temperature of the clutches at all times, which Ed says was a must for proper clutch adjustment. The car did not have shocks, but still used a highly developed Nova Car suspension (very trick and very adjustable). The car had a trailing axle that is derived from a Midget race car. The axle was a very light 2" splined hollow axle. The front role centers were raised. Track front and rear were widened. The wheelbase was lengthened from 81" to 87". The original urethane shocks/ bumpers were replaced with German rubber springs, which look like a hockey pucks. Ed had them in a full range of spring rates. They have the same linear rate as a ordinary spring. Ed says, "The car is quite adjustable and the suspension works very well. I retained the "H" link in the rear, slightly modified, but it is awesome when raising or lowering the rear role center." Jay Novak reports, "I designed the original suspension for the NovaKar F500. The rear suspension on this car has been significantly modified from it's original form to fit the engine. The H-link mechanism (Nova-link) you are looking is the part of the car that is original. Although they have remounted it in a somewaht different position. I have not seen this car for several years & it looks like they have the H-link mounted much lower than the original design. The roll center is defined by the intersection of the 2 lateral links that go out to the end of the axles. This means that the roll center is below the H-link. This linkage does not do anything other than provide lateral location for the axle. The forward facing H-link is attached to the chassis by heims & acts just like an A-arm & it moves up & down as the suspension moves. This mechanism does not provide any anti-squat or roll stifness to the car at all. If you disconnect the springs the axle will just rotate abut the instant center at the intersection of the angled lateral links. This is the earliest version of this suspension that I designed & the current F500 system, while conceptually similar has a much wider base for the H-link & the diagonal lateral links are much shorter. The pupose of this system was to allow for the adjustment of the rear roll center height as a tuning tool. The F500 rules do not allow for the use of anti-roll bars & moving the roll center is a very good way of changing the roll couple distribution. It is a very usefull tuning tool & really works exceptionally well." Aerospace Brake and Racing Components from St. Petersburg, Florida, were also a sponsor. They had provided huge brakes for the car, which was a must for a car with no engine breaking available. Aerodynamics, ground effects - including front and rear diffusers, and body work were completed by Tim Cooper. Mr. Cooper was the fiberglass, body, and aerodynamics person for Alex Jobe Racing back in the IMSA days. Ed says, "Mr. Cooper is an unbelievable talent. He really knows his stuff. Other than the airbox, Mr. Cooper is the reason this car goes so fast down the straight and through the corners. The ground effects are working so well, I have reduced the wing size twice. I currently only using a 45" X 9" wing, and it is still too much through fast sweeping corners." The wing shown in the photo's was the original large wing. Later, in 2003, Ed converted the power plant, made further modification, and renamed the car the JED chassis. Very large photo link here.